I want to take a moment and thank everyone who listened to our preview episode and sent in their feedback. It was immensely helpful, and I-Hsien and I truly appreciate it as we try to make Total Party Thrill the best RPG discussion podcast we possibly can. All of that effort and kindness has finally borne fruit, as yesterday we officially launched on iTunes, and only a couple days later than we anticipated! Our third full episode (Player-Centric Campaigns & Combat Medic) went up today, and we’ll continue a weekly Thursday release schedule. 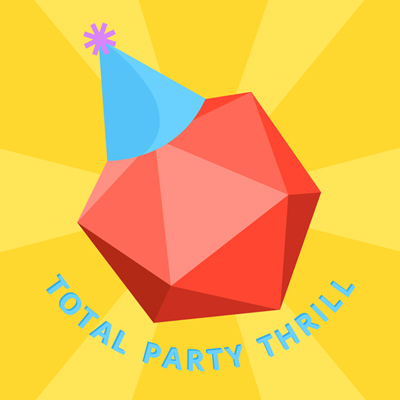 Total Party Thrill is a podcast for GMs and players where we discuss our campaigns in order to inspire yours. We draw heavily from a 3-year, level 1-20 D&D 5th Edition Eberron campaign. Each episode covers a particular aspect of game planning and playing, and we share tips and advice drawn from our own experience. Then follow us into the Character Creation Forge, where we build iconic character archetypes from outside traditional D&D using the D&D 5E rules. This entry was posted in Dungeons & Dragons, News, Podcast and tagged 5E, d&d, dnd, Dungeons and Dragons, iTunes, Podcasts, RPG, Total Party Thrill. Bookmark the permalink.